Fox has announced the Red Dawn remake for Blu-Ray release in March. The film stars Chris Hemsworth, Josh Hutcherson, Isabel Lucas and Jeffrey Dean Morgan. The Red Dawn remake is one of two films that struggled finding release after being put on the back-burner over at MGM for X amount of years. The first film was The Cabin in the Woods, which finally saw a release last April. Red Dawn had even more problems getting a release, at one point getting a CGI makeover so that the enemies weren’t Chinese. Still, the film finally saw a theatrical release back in November and while it didn’t play over the greatest, it did enough business to not be considered a complete flop. Part of that reason was due to the sudden success of now-stars Chris Hemsworth and Josh Hutcherson. Both men have had some luck in other more lucrative properties, like Thor/The Avengers and The Hunger Games. I liked the remake for what it was, but I wouldn’t say it was worth the several years wait to finally see it. It’s a bit cheesy and downright silly at times, but the action is filmed well and the entire cast is likable enough to the point of you not wanting them all to die in a horrible fire. That’s more than I can say for a lot of films in release these days. 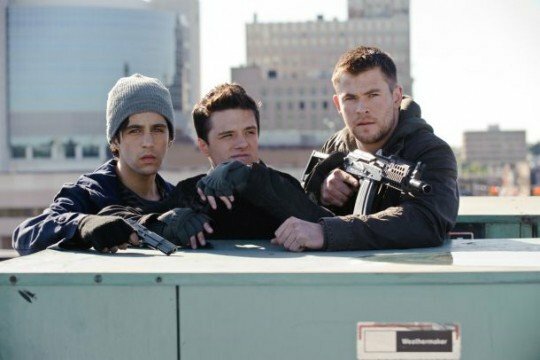 Red Dawn might not be good enough for fans of the original film, but it should work fine for younger generations that are looking for a lighter-toned look at the possibility of WWIII. Red Dawn will be available for purchase on March 5th, 2013.